Halloween may be over, but a few kids just experienced a big trick when it came to their treats. 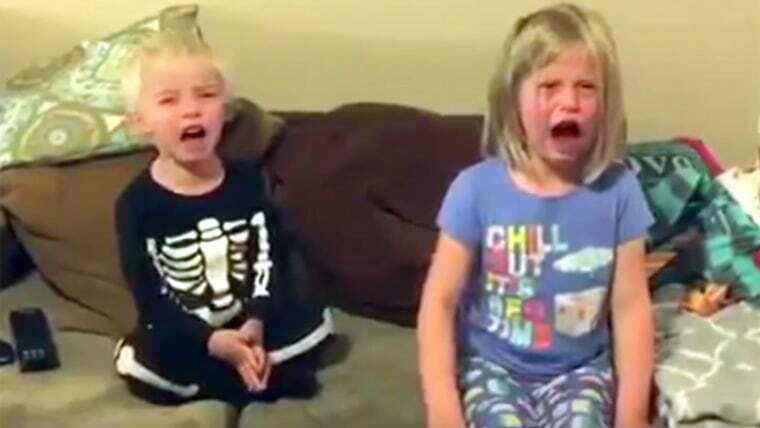 Once again, Jimmy Kimmel's annual holiday prank prompted parents to tell their children that they ate all of their hard-earned Halloween candy. And once again, the reactions from the little ones did not disappoint — at least for viewers. Some of those prankster parents, however, might have been a bit taken back by kids whose responses ranged from an F-bomb to a flipped finger. "Yep," one boy responded to his mother's mock candy confession, "and that's why I don't love you anymore." Another wee one looked shocked as she offered advice to a mom who claimed she was so hungry and couldn't help herself. "You just have to eat more lunch!" the tot told her. Some cried, others yelled and at least one suspicious son gave his parents the side-eye and said, "I think you're trying to trick me." But the best reactions of all came from two boys who each possess a very understanding nature. "That's fine," one said. "That's OK. You can do whatever you want to." The other offered a sincere "I forgive you." Kimmel himself, who handed over his show to guests hosts this week, sent in a video of his own daughter, 3-year-old Jane, reacting to the prank. "What?!" she gasped before finding the lone roll of Smarties he left in her bag. "I still have one. Don't worry." However, when stand-in host Channing Tatum gave it a try, he was left asking for forgiveness from his own little girl.